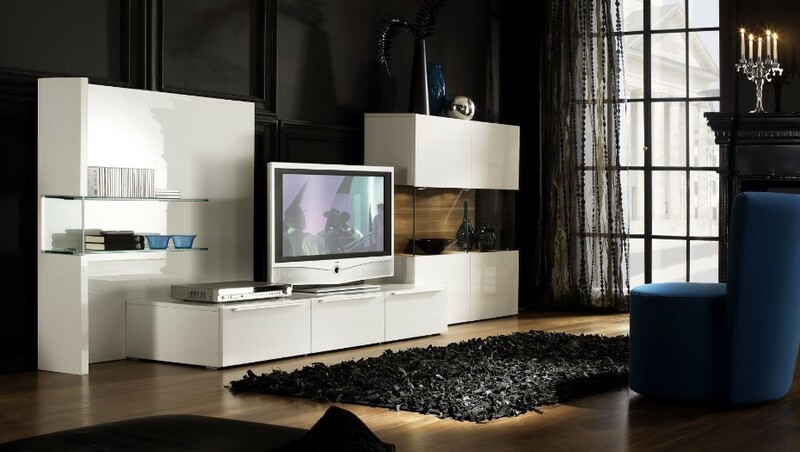 DVD storage ideas for small spaces – In this digital era, there are a lot of ways for people to enjoy movies. For those who chase the pleasure of watching the newest movies, movie theatres or cinemas are absolutely their favorite place to come to. Meanwhile, there are some others who don’t have the luxury of lots of free time to go to the cinema. They need to have patience for the movies to be played on TV by their favorite TV channel or for the movies to be released in the form of DVDs. What is DVD? DVD are also known as a digital video disc. It is a storage format for digital optical disc found and developed by Phillips, Panasonic, Toshiba, and Sony in 1995. Actually, a DVD is not for storing video programs only; it is for storing any kind of digital data generally. There are two types of DVD available in the market, DVD-ROM (ROM stands for read-only memory) and rewriteable DVD. DVD-ROM named so because the data within it can only be read and not erased or written. Its other name is prerecorded DVD. A prerecorded DVD is initially a blank recordable DVD disc which can be recorded only once with a DVD recorder before functioning as a DVD-ROM. While the other type of DVD, the rewriteable one, can be recorded and erased more than once. Lucky you movie manias, DVD nowadays come in the same dimension with the past CD (compact disc) but with much higher storage capacity enough to store a very high definition movie which has large memory. Imagine if the digital data storages still come in the form of large LD (laser disc) and you need an LD player to play your favorite movies. How troublesome it can be. However, no matter what kind of movie storage exists right now, if you have a bunch of them, you will still face a problem of organizing them, eventually. Well, this article will discuss about DVD storage ideas that will be helpful in storing your DVD collection as much as in displaying them presentably. Check the lists below! This idea of DVD storage is inspired by music levels and therefore the appearance simulates equalizer bars and sound levels. Thus, this storage shape is different from the usual rectangular shelf which you commonly see everywhere. 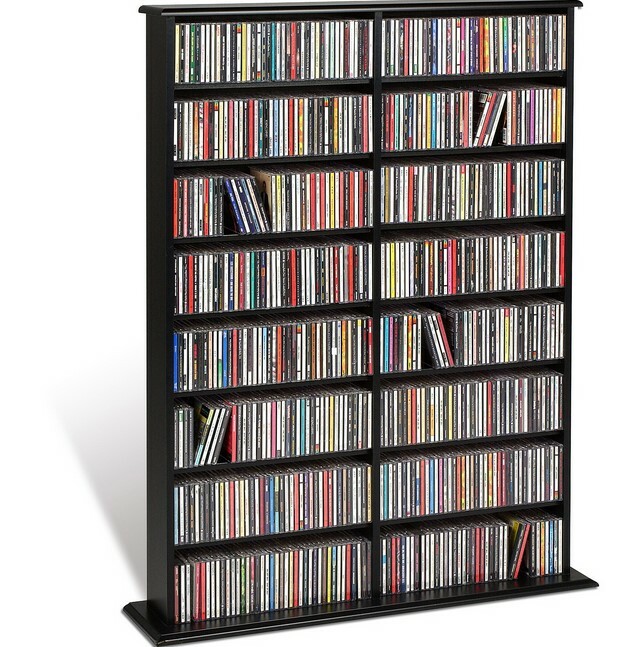 You can make one that resembles like this one by yourself of course, but you will need a modern technology of laser cut to get the right measurement as the height of each slot fits the height of each DVD precisely. As for color selection, choose intense pink as vibrant finishing. Or, if you don’t like the sound of pink color selection, you can go for neon shades or wonderful blue-green. 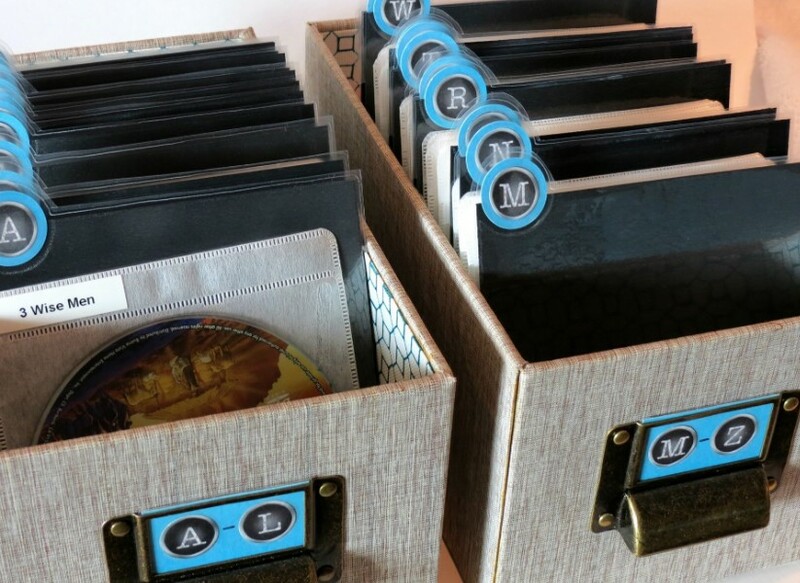 If you love vintage theme, then this DVD storage idea is perfect for you. What great about this binder storage is that you can sort your DVD collections based on certain category you prefer, like movie titles, genres, or your favorite actors or actresses. That kind of method eases you to find what movie you want to play at the time providing how diligent you are in organizing your collections. Besides helping you in managing DVDs accordingly, this kind of DVD storage is also very affordable. No need to prepare high budget in making or buying it. You can buy it online, by the way. Though not 100% similar with the one in the picture, a DVD storage with the same binder method is available for purchase in Keep Filing. Keep Filing has the thing called DVD Binder with Title Pages. You can look for the price as budget reference of how much you need approximately to spend in order to have this DVD binder storage. 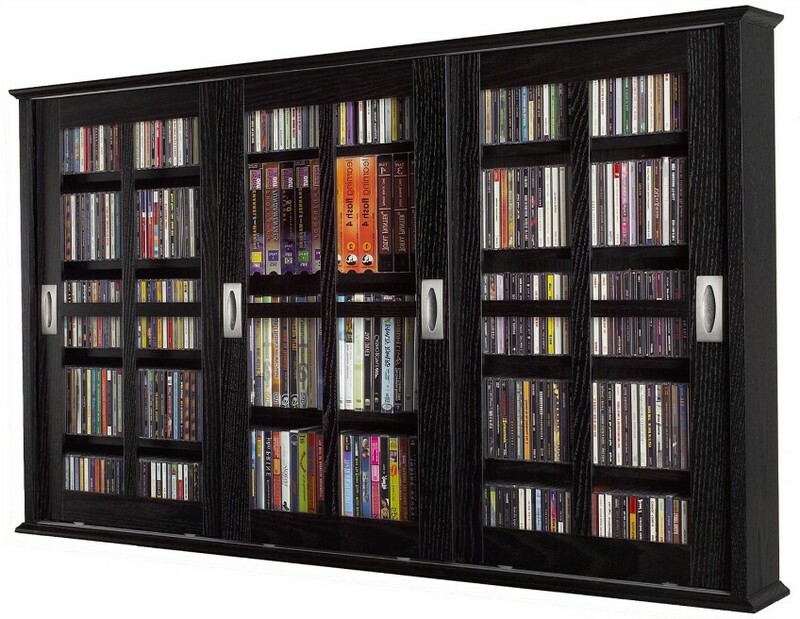 This one is another music related ideas for storing your DVD collections. The first one was inspired by music levels and thus has the appearance of equalizer bars and sound levels. Now this one is inspired by music instrument: violin. From aesthetical point of view, this violin shape storage space is very fashionable but also peculiar at the same time. It was made from a wonderful warm wood with conventional quality. This music instrument shape storage space will absolutely be a gorgeous display for your DVD collections and suitably placed in any kind of homely media or entertainment room. If you have high budget in organizing your home entertainment room, then you have to consider building it or having this one. Border audio parts and a big display TV seen in the picture become the household members of a 1930’s farmhouse. Placed there to be the after-look of an upgraded entertainment room, the display TV, and border audio parts still have the vintage touch in the greatly paneled area. As you can see, the whole set has an additional slightly useless narrow to deep wardrobe. It might be a little not useful at a single glance, but when the wardrobe is expanded, the set will have the space big enough for many things. By many things, it means the space will be able to hold a television, storage room, and also cabinets in various dimensions to match DVD’s, CD’s, card games, and even blankets and parlor game. And the space behind the TV fits an adult person to get in and manage the electrical wiring links commonly needed in the media room. 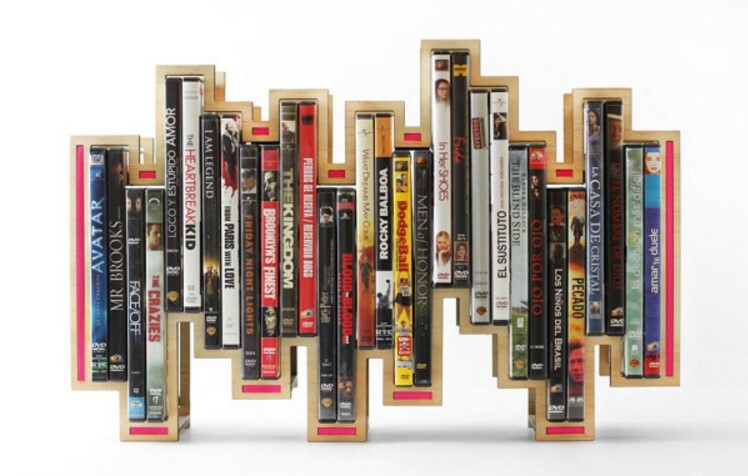 So, there are no space wasted with this fabulous DVD storage design. Something with LED is so happening right now. You are considered up to date if you have at least one of them, an LED emergency lamp, for example. Well, now there’s this item called an LED clock. Interestingly, you are not having only an LED clock but also a DVD storage as this clock is designed in such a way that has the appearance of a shelf big enough to fit the height of DVDs. 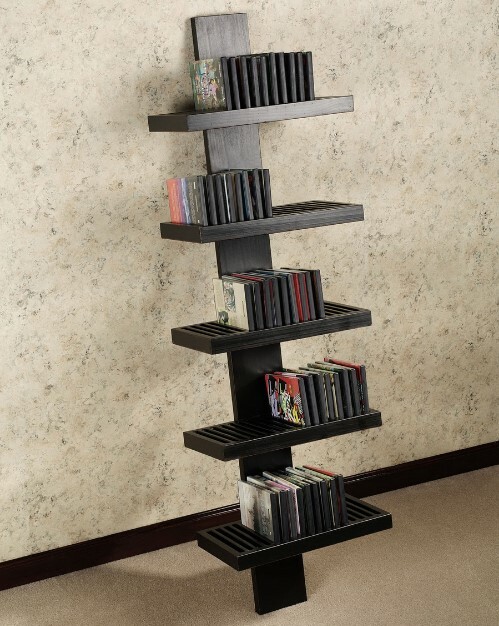 Kill two birds with one stone; yes, the proverb fits this DVD storage idea precisely. Besides helping you in managing your DVD collections, it can be a cool decoration in a bedroom owned by an adolescent young boy. Are you crazy for elegance and everything you have must look elegant? If the answer is yes, then you can definitely store your DVDs with this storage system as this is not only elegant but also functional, too. 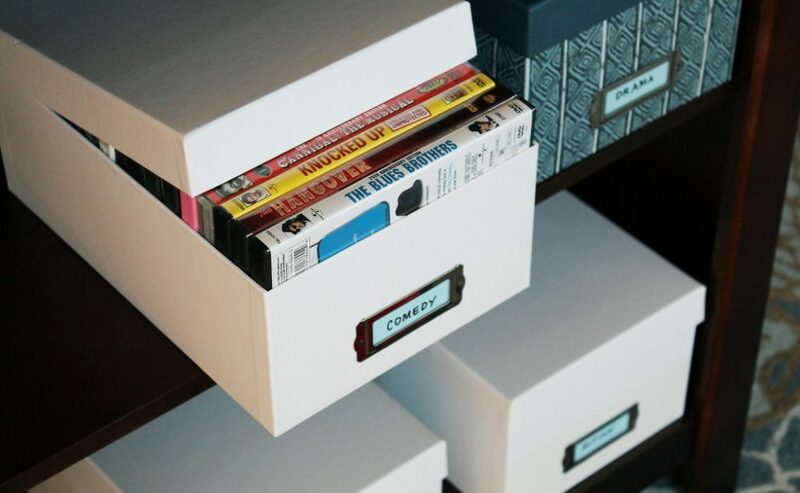 As seen in the picture, with this kind of system, you store the DVDs with their title sides facing upward to the drawer opening instead of stacking them high that force you to undergo the inconvenience every time you want to watch a certain movie. When the title side faces you, it eases the job to look for the DVD you want. You can do the searching quick as it organizes DVD well. Rather than at private living spaces like homes, this DVD storage concept is more suitable to have in public places which attended daily by a large numbers of people like libraries or DVD rentals. However, there are certain people who love movies and collecting tons of DVDs, provide a very high budget in organizing their collections and a vast space at their homes and want to have one of these kinds of DVD storage. At residential homes, this whole set is called Media Center. It is in trend right now and also a favored renovation order for existing homes. It is designed openly to create close distance to the neighboring area inside the house like kitchen, for example. 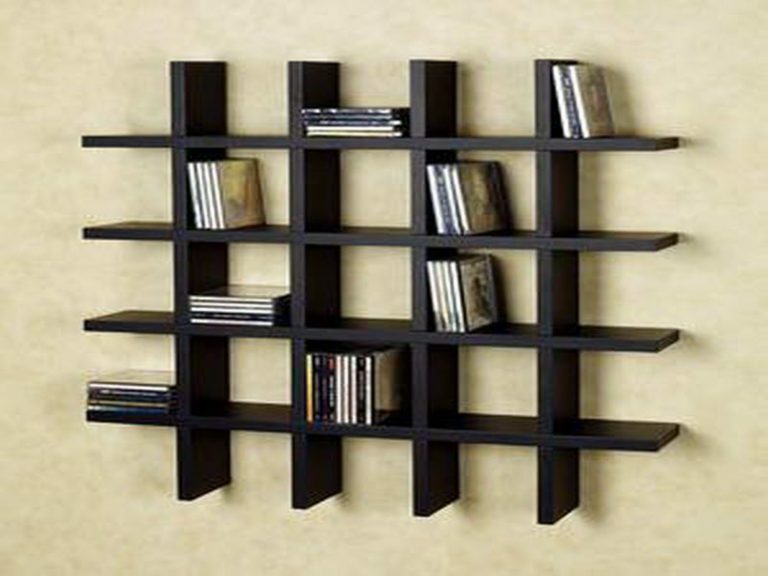 DVD Storage Ideas, This rounded cardboard rack not only gives area for your film DVDS and also magazines, nonetheless additionally improve your house interior design. Appreciate with color This collection of storage space boxes offers a dynamic focal point for the room, in addition to abundant location where to maintain in addition to existing items. It demonstrates remarkably that you don’t constantly need to hide points away: a neat display of publications and rewards can make an appealing function in its personal right. 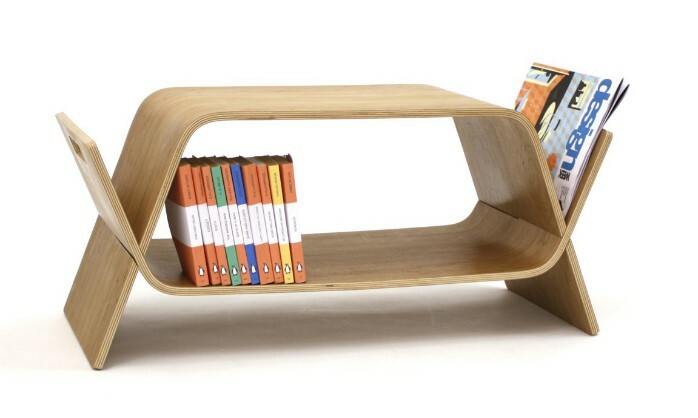 This is actually a bookshelf but can be functioned as a DVD stand also. 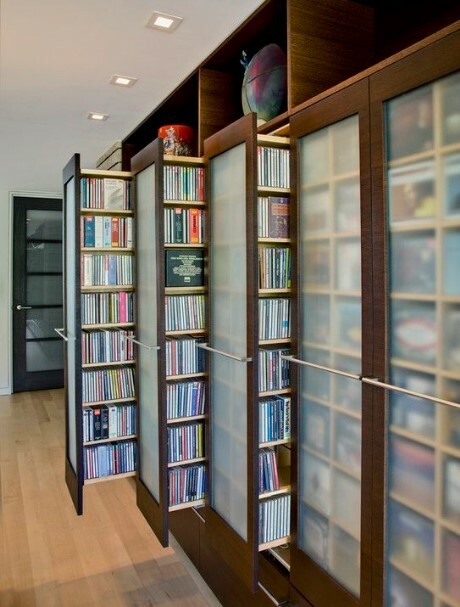 This kind of DVD storage is very practical as you only need to lean the upper side to the wall. It is higher than 2 feet in height and longer than 1 foot. Considering the design, it can hold up to 50 DVDs based on the density of DVD instance. The name really implies what this DVD storage means: unique. Unlike any other standard rectangular DVD storage, this unique organizer comes in the shape of mini coffee table with two wings on each side designed in such a way that can hold some magazines, too. It is absolutely an organizer, especially to DVDs, but at the same time it is also a display which can liven up any of your room where you place it. Not to mention, with its uniqueness, it is also a part of home decorations, right? 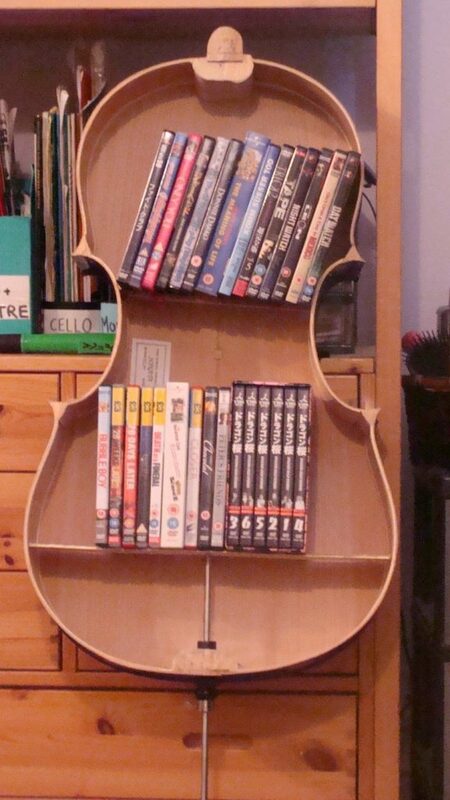 Conclusively, this unique DVD storage is one of the best DVD storage ideas exist. The only disadvantage of this is the DVD holding capacity is limited. If your bedroom theme is all about your DVD collections and the purpose of your bedroom existence is to make you more comfortable in enjoying movies, then the storing idea seen in the picture is absolutely the best. This definitely gives the description of what hobby you enjoy the most which none other than watching motion pictures, you know, with the alphabetical selection of D, V, and another D shaped to the shelves. When you have your room done by an expert, you know you can customize any of your cupboards, drawers, or wardrobes. The picture shows one of the examples. 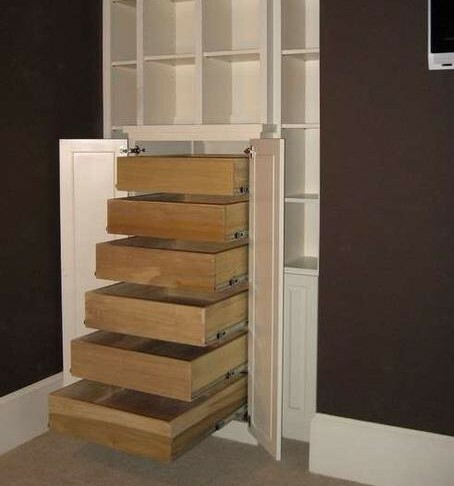 This is apparently a cupboard with upgraded multidimensional drawers. The additional unit is for storing DVD, video game parts, computer game, and even a television with the right height drawer measurement. Customized furniture has one main advantage. It is especially designed and made according to your preference, so that makes it rarely owned by other people. From a single look, you will directly recognize this cupboard sized DVD storage has multi functions. Besides its main function as an organizer of DVD collections and magazines, this also increases the value of your home as part of the home interior design. It has big capacity in storing things. 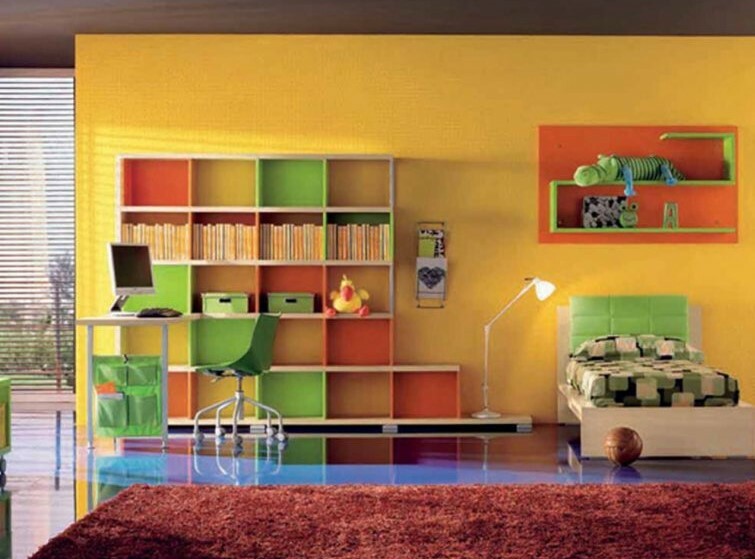 However, due to its big form, it will be troublesome when you want to reposition the furniture of your room. Some additional help will be needed, of course. 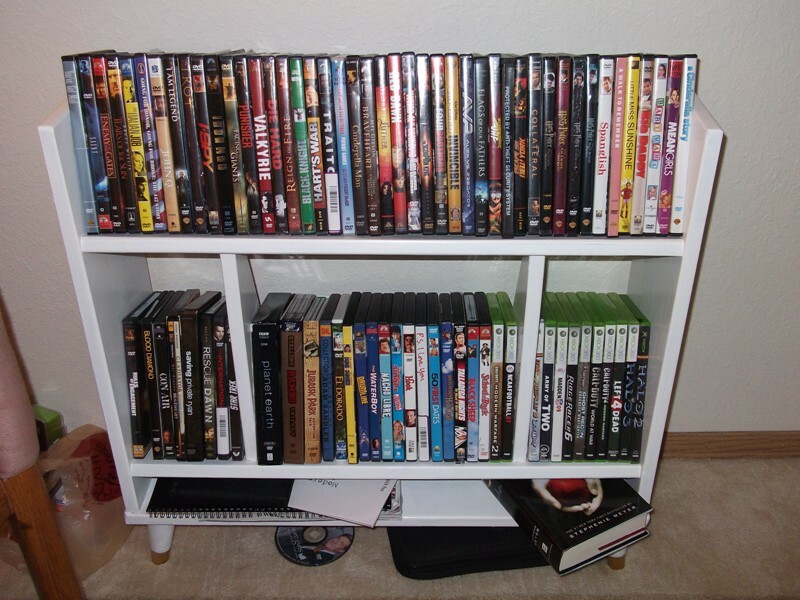 If you are a serious DVD collector, you need to consider having shelves for storing your DVD like the one in the picture. 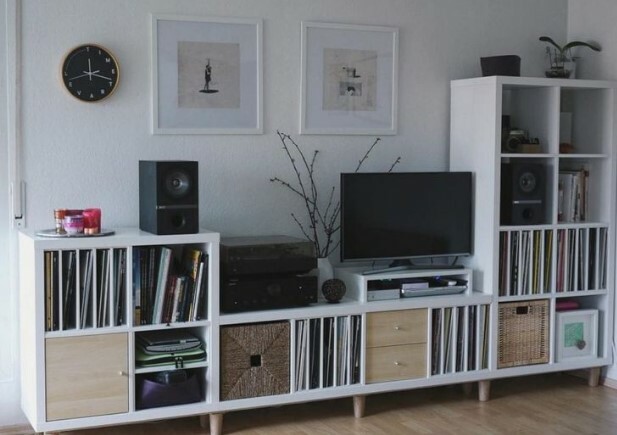 As they look stylish, this kind of DVD storage can be the focal decoration of your whole room. It looks sturdy, attractive, and multifunctional. The shelves which divided by a central divider can hold more than 130 DVDs. You can freely customize the height of each shelf according to the needs of your collection as each shelf is fully adjustable. Luckily, this DVD storage shelves are available for purchase online under the trade name of Prepac Double Media Tower and Walmart has it for USD 67.99. This one idea can come in so many forms. As long as you can store your DVD collections invisibly, there, you have a hidden DVD storage. The picture gives you an example of storing DVD unseen using shoe boxes. As it is unseen, you probably will face a problem of difficulty in finding which DVD goes to which shoe box, right? You can avoid such matter by simply grouping the movies according to their genres into the same box and give each box a label. A lot of money will be saved if you execute this hidden DVD storage idea as it costs you almost nothing while at the same time you also take part in ‘zero waste’ campaign by making use of something unwanted instead of throwing them into the bin. 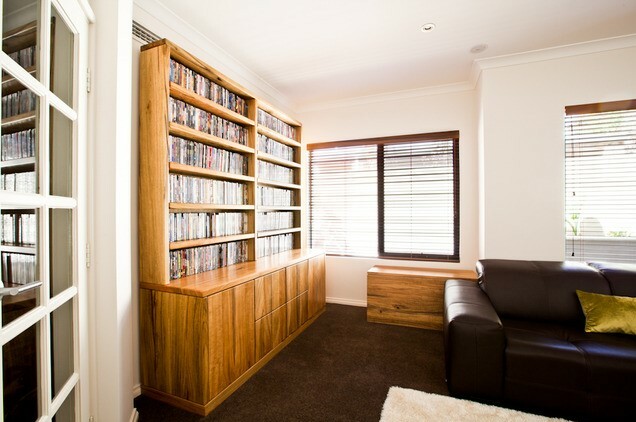 Now, this is one of the great DVD storage ideas of both managing your DVD collections and decorating your empty wall. Using wood as the material, it surely gives a statement to the entire room. It is very suitable for small room. As it needs to be mounted on the wall, it helps you in saving floor space and thus eases you also in cleaning the floor. Modern media collection This media storage area system is consisted of 2 seperate items: a tower and a stand with a back panel that could be gotten utilized to match your demands. This collection materials 2 cabinets for covert storage room as well as a lot of display screen room. DVD Storage Ideas. The storage room area, when lengthened would absolutely produce sufficient space for a big TELEVISION, part closet and a series of varying dimension cabinets to fit CD’s, DVD’s, card games as well as many substantially a huge quantity storage space for treatments as well as parlor game. Left over area over the pull out cupboards as well as behind the TV would permit a specific to obtain in along with conveniently make the vast array of circuitry links required for contemporary components initially and in the future. Storing, managing, or organizing your DVD collections will not be a problem anymore now you know there are a lot of very cool means to do it. The only thing you have to do is selecting what method suits you best. Do not forget to consider some aspects, like how much DVD you have, how much budget you prepare, and how functional your want your DVD storage be. 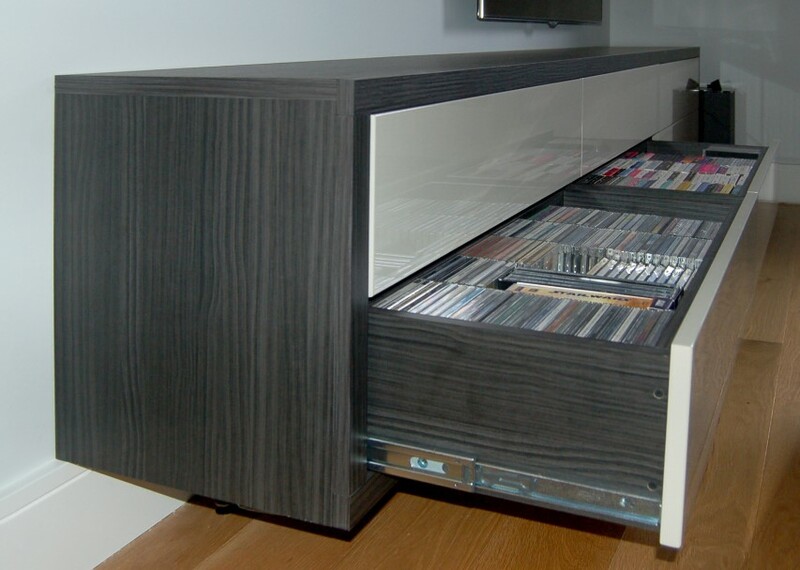 Hopefully, the fifteen examples of DVD storage ideas discussed in this article, can be of any help to you.